Pictured-a scene at a volcanic beach somewhere in Hawaii. A painting of Barack Obama and his unicorn Penelope relaxing at the far western White House, Camp Lei. Click image to view larger. Thanks to RacketMag for the recent interview. A painting of Barack Obama and his unicorn Penelope purging the skies above Washington D.C. of Rush Limbaugh and his golden EIB microphone. Obama , Penelope, and Rush Limbaugh have an encounter in the sky above Washington, D.C.
Penelope checks the Spf on a bottle of suntain lotion as she and Barack Obama relax in their secluded Hawaiian getaway. Featuring a volcano and lots of flowing lava. Thanks to the Silicon Valley Insider for the article regarding the Nick Denton painting, which can be viewed via CNN. Gawker Media entrepreneur Nick Denton with pancakes on top of his head. Now, back to the Obama Unicorns. Three are in progress. A painting of Barack Obama and his unicorn Penelope at Guantanamo 'Gitmo' Bay, Cuba. In progress. This painting is available as an 11 by 17 inch art poster for $35, printed on heavy 60 lb bond, signed by the artist and shipped in a sturdy mailing tube. A hand drawn Faithmouse cartoon is included with your order. Newly inaugurated President Barack Obama poses on his trusty unicorn Penelope in front of the post apocalyptic Washington D.C. Capital dome of Fallout 3. This painting originally included an exploding Enclave vertibird in the sky above Obama's head, as well as a tuxedoed John McCain super mutant behemoth ambling down the steps while carrying the Lincoln Bible on his car door arm, but I decided the image was getting too busy and removed them. Pretty enough as it is, I think. My 'Wall Street Obama' painting recently appeared on the Fox News RedEye program. Thanks to the Financial Times Deutschland for the interview and inclusion of two of my paintings in their recent 'Weekend' article. Click above to view larger image. Thanks to The Art Of Obama for the recent post of the Hudson River Miracle Obama. Decided to redo my 'Fallout Obama' painting, which is based upon the Fallout 3 video game and its setting of a post nuclear Washington, D.C. Here's the President-elect is posed upon his unicorn Penelope, the latter of whom is decked out for the inauguration in a vault dweller uniform. An enclave vertibird explodes in the background. Acrylic underpainting shown; still need to add a number of figures to the scene, including a John McCain super mutant behemoth ambling down the Capital steps. Hopefully I'll get the finished image posted sometime pre-inaugural. http://www.sensibleerection.com/entry.php/74255 "Has Dan Lacey's blog really never been posted here?" A 24 by 30 inch stretched acrylic painting of Minnesota Twins player Joe Mauer taking a swing at a pancake and missing. First panel of a new Faithmouse cartoon, which I've been developing on the Faithmouse Megathread II at Something Awful. Thanks to POE-NEWS, where I've been nominated as best poster of 2008. My current Barack Obama 'Wall Street' painting is at $500 on Ebay with four days to go. Thanks to the current high bidder; it's a pretty nice painting-I'll throw in some original Faithmouse cartoons to the winning bidder as well. A 16 by 20 inch stretched canvas horse art painting from summer of 2008, painted on-site in the stable area of Canterbury Park racetrack in Shakopee, Minnesota. Junior launders using a bathroom plunger in a metal bucket. Painted in both acrylic and oil. 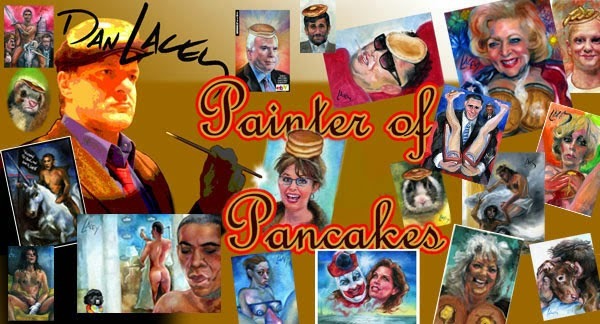 Thanks to Gawker for posting an Obamicon of my Palin Pancakes painting. President-elect Barack Obama leaps from his unicorn and takes down a rampaging bear on Wall Street. Painted for this weekends' Financial Times Of Germany. A miniature acrylic painting of an apple with a pancake on its head. A miniature oil portrait of a goldfish with a pancake on its head. A miniature oil portrait of a Sir Charles Barkley bobblehead pancake doll. A miniature oil portrait of doctor Richard Batista with a kidney on top of his head. A miniature acrylic painting of an Intravenous fluid IV bag with a pancake on its head. Painted on Wednesday in my wife's hospital room. Chris praying the rosary, can of Diet Coke nearby. A miniature oil painting of another Harry Reid pancake cave-in. This one centers around Rod Blagojevick's selection of former Illinios attorney general Roland Burris to fill President-elect Barack Obama's empty Senate seat. A miniature oil and acrylic painting of a lighthouse pancake disaster. Beautiful seascape artwork, which would make the perfect accent over a small frumpy armchair no one ever bothers to sit in. A miniature oil and acrylic painting of a pancake stalking another pancake, while a third looks on. Painted on the grounds of St. Nicholas Catholic Church in New Market, Minnesota. A 20 by 24 inch stretched oil portrait of Blessed Mother Teresa with a pancake over her head. A miniature acrylic and oil painting of DFL Minnesota Senate candidate Al Franken. Not a bad portrait. Image is from my scanner, but I think the gold metallic background bounced the light around and made some of the skin tones seem more opaque than they actually are. I'll try to get a better image tomorrow with my digital camera under natural sunlight. A miniature acrylic and oil painting of a delicious rainbow trout, evading capture by a hungry bear and her cub, while the woods burn and the head of Obama looks on in the foreground. A miniature acrylic and oil painting of Bill O'Reilly and Dennis Miller of the Fox News channel with pancakes on their heads. A miniature acrylic portrait of probable future New York Senator Caroline Kennedy with a pancake on her head. Special thanks to The Art Of Obama for the recent post of the recent New Year's painting.